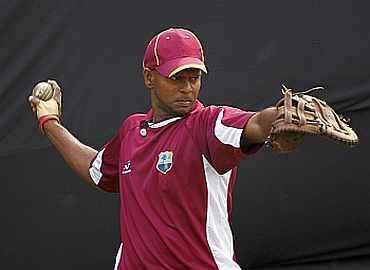 Lagging 0-2 in the three-match Test series, West Indies are sweating over the fitness of their key batsman Shivnarine Chanderpaul ahead of the last match starting at the Wankhede Stadium in Mumbai on Tuesday. The veteran left-handed batsman did not practise with his teammates on Sunday morning as he is resting to his injured calf muscle, according to West Indies media manager Philip Spooner. "He has taken a break from practice today, to rest his calf muscle which he strained in Kolkata. But he should be able to play in the Test here," said Spooner. The 37-year-old Guyanese has scored over 2,000 runs in 23 Tests including seven hundreds at an average of 65.74 against India and will be crucial to West Indies's hopes of notching up a consolation victory in the third Test. He has scored a century (118) and two 47s in the four innings so far. The other West Indians had a good practice session in the morning while the Indians had an optional session in the afternoon. Among those seen practising at the stadium were Sachin Tendulkar, who is one century short of completing a 100 international tons in what is going to be his 9th match at his home venue. The champion batsman, who has notched up 51 Test and 48 ODI hundreds so far, has previously scored only one hundred at this venue, 148 against Sri Lanka in 1997 though he averages just over 52 in Mumbai. Zaheer Khan, who is not in the squad as he's recovering from ankle operation, came to the ground when the team was practising and warmed up, besides having a lengthy stint at bowling in the nets. The India pace spearhead, who broke down after bowling just 13.3 overs in the opening Test against England at Lord's and then underwent a surgery in London, has started to ease into cricket action. He's expected to play in one forthcoming Ranji Trophy league tie for Mumbai to assess his match fitness.